During our training, preparation and placements, many of us are filled with a natural human anxiety, worrying about the first time we stand at the Altar, before a congregation, about to celebrate or preside at the Eucharist. So much so, that we may be in danger of forgetting that we too are present among the congregation, to be enriched and fed spiritually as we meet Christ, present in Word and Sacrament. But there are other questions and dialogues too. At one level, there is the simple dialogue about the language and vocabulary we use. Do we call this [pointing] an altar or a table? At the epiclesis, who re we invoking the Holy Spirit on: on the offering of bread and wine? On those present? On the Church? On all three? These questions of language and vocabulary are often cultural rather than theological, delimiting or setting out our tribal boundaries and barriers rather than discussing central theological truths. But there two other languages that we may want to discuss this evening too. The first is body language. Non-verbal communications include facial expressions, the tone and pitch of the voice, gestures displayed through body language (kinesics) and the physical distance between the communicators (proxemics). These non-verbal signals can give clues and additional information and meaning over and above the spoken or verbal communication. Professor Albert Mehrabian of UCLA came up with the now famous – and famously misused – rule that verbal communication is only 7 per cent verbal and 93 per cent non-verbal. The non-verbal component was made up of body language (55 per cent) and tone of voice (38 per cent). So how I process into a church, how I stand at the altar, how I stand at the Creed, how I use my hands, whether I lift up the bread and wine, whether I lift up my eyes … all those nonverbal forms of communication are important for the person who is celebrating or presiding at the Eucharist. Part of this too is how I use space, how we use colour, where we sit, how we use the presidential space, how I treat the sacred elements and the sacred vessels, what we place or do not place on the altar, how we treat the remaining sacred elements and sacred vessels after all have received the Sacrament. The second is a language that has come into play in recent years. This is the discussion about form and content. In the debate about Fresh Expressions, Andrew Davison and Alison Milbank argue coherently that in losing the form of liturgy we are in danger of losing the vehicle by which we convey the tradition, that we are in danger of losing the content. If we stop seeing the Church as being the Church of Word and Sacrament, and then reduce the Word to how we promote our own interpretation of what we decide is ‘the Gospel message,’ then we become one more discussion forum and stop being Church. Simon Reynolds has also introduced a discussion about the way Liturgy is often reduced to what passes for worship, but the content of this worship is often determined by its entertainment value. So as we are gather the candles are lit, and the altar is prepared for our celebration. It is covered with a fair linen cloth (see The Book of Common Prayer, p 77). On this, in the centre, we place the corporal, a square white cloth. On this stand the chalices and the paten, covered by a burse and veil in the appropriate liturgical colour. In addition, there are two purificators for the administration of the chalices. The pocket of the burse has the chalice corporal inside it, with the pocket facing where the presiding priest is going to stand for the Eucharistic Prayer. This chalice corporal is used to cover the communion vessels after we have all received. The Greek work ἐκκλησία (ekklesía), which we translate as ‘Church,’ refers to the gathering of the people, the calling out of the world and into the assembly. Before the arrival of the priest, the congregation gathers. We are there first and foremost as the gathered or assembled church, believers. Others may be guests, and welcomed guests, but it is not a secular gathering, on the one hand; nor, on the other hand, is it a meeting for evangelism. The presumption first and foremost is that those present are baptised believers. We meet in his name, and we do as he commanded us. The candles are lit, the lectern is dressed in the liturgical colours of the season: which is green in Ordinary Time, including this time from the day after Pentecost and the beginning of Advent. The memory of the silent prayers said by the priest before presiding or celebrating is retained in Holy Communion 1 in The Book of Common Prayer, where it says ‘The priest stands at the Lord’s Table. The people kneel.’ And then the priest prays the Lord’s Prayer – without the doxology – alone. We too should be silent as we gather our thoughts, our minds, ourselves as we prepare to celebrate. 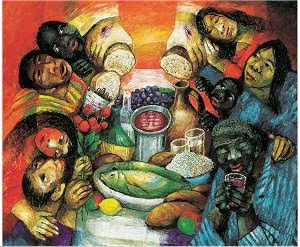 But when we celebtate, we are all celebrating, celebrating together; we are all co-celebrants, and the person who presides is the one who seeks to bring it alive, to animate what is happening, to see that it truly is the liturgy, the work of the people, and not something we are present at as spectators. As the people gather, the many come together to be one body. We are gather together as one people. The priest who is presiding is the last to enter, and we stand – in silence or singing a hymn – ready to be gathered together as one body, and the priest joins us before the altar or table. The liturgical greeting is not the same as Good Morning. And it establishes who is presiding, the presidency, so it should not be left to a Reader or an assistant. Although from Easter Day until the Day of Pentecost, for example, it varies from this. A sentence of scripture may be read, and the presiding minister may introduce the liturgy of the day. The canticle Gloria in Excelsis may be omitted in Advent and Lent and on weekdays that are not holy days. In Holy Communion 1, the canticle Gloria comes after receiving Communion. Its present place restores Gloria to its place in 1549. We have been forgiven, then – like the angels and shepherds – we can give Glory to God who comes among us. When we use Gloria, we should use it joyfully, it is full of images that children love. Resonances of its words can be found in some form in almost all Christmas carols, for example, and children delight in its images, its words and its pictures. We are all asking for something … and we should give people time to think of what they need before praying the Collect of the Day. The doxology, ‘Glory to the Father ...’ may be omitted at the end of Psalm in the Eucharist, for the Psalms are valid Biblical prayers without having to be ‘Christianised,’ and on Sundays we have given our glory to God in singing Gloria. It is traditional to omit to doxology at the end of the Psalms during Lent and Advent. After the New Testament reading, we often sing a canticle, psalm, hymn, anthem or acclamation as a gradual before proclaiming and receiving the Gospel. And that leaves us standing to receive the Word of God, facing the Gospel, which is best proclaimed and received, not from the table or the altar but among the people. The Word is not just proclaimed but is received, and we must take it for granted that at every celebration of the Eucharist there is an exposition of the Word, so people can receive it, so we can own it, so we can integrate it into our faith. And the Liturgy of the Word then naturally reaches its climax when we share in the common confession of the faith of the universal Church, the Nicene Creed. We may use other creeds in other forms of worship, but The Book of Common Prayer insists on the Nicene Creed alone in the Eucharist, and on Sundays and Principal Holy Days. But bear in mind, firstly, that these are the prayers of the people, not of the priest, and secondly, that you do not need to pray for all things at all services. Brevity and simplicity are important, corporate silence is important, and we should not hijack the prayers of others, the piety of others, and we should not displace the importance of the Great Thanksgiving, for the Eucharist itself is the Thanksgiving par excellence, and this should never be obscured by the content of the intercessions. In him all things in heaven and on earth were created, things visible and invisible, whether thrones or dominions or rulers or powers – all things have been created through him and for him. He himself is before all things, and in him all things hold together. But we have more to offer. Most people think of the offertory as the collection. But it is not, at all. It is about offering God back what God has offered us … food and drink to nourish us, transformed by our labour, the fruits of our labour, our sweat and toil. The bread to be used shall be the best and purest bread that can be obtained. Care is to be taken that the wine is fit for use. If the priest washes his or her hands at Lavabo, it is good table manners. Remember how over and over again, the Church uses water as a sign of purity and purification. We sometimes get this so wrong. How often do we find the bread and wine are already on the table or altar, or on a credence table at the side where no-one can see them? If the bread is little bits of sliced pan already cut into tiny squares, how are we going to break the bread together? And those who preside should show they are taking this bread and wine – and this is not about elevation. Only the bishop or priest then may say: ‘Christ our Passover …’ This is one of the roles of the president, and cannot be delegated. There are three Great Thanksgiving Prayers in The Book of Common Prayer. For example, Prayer 3 looks back to the past, looks to the present, and looks to the future. It is remembrance and anticipation of the beginning and the fulfilment of Creation. There is a true epiclesis or calling down of the Holy Spirit on us and on our gifts, it is fully Trinitarian, and its responses and refrains reminds us that Liturgy is the Work of the People, that we are all celebrating together. The spirit of each of these three prayers is thanksgiving. It is not supposed to be quiet, or penitential, or singular. The appropriate posture is that we are all standing, for all are celebrating. But how many people when they are leading the liturgy change this by asking people to kneel, or by asking them to kneel for Sanctus. The only rubric for posture in Holy Communion is ‘Stand’, and, as Bishop Harold Miller says, the normal place for presiding is behind the altar/table, with hands out-stretched throughout the prayer. Notice the four-fold movement of taking, blessing, breaking and giving. Earlier, we had the taking of the gifts of bread and wine. In the thanksgiving, in the invocation of the Father, the Son and the Holy Spirit, we have the blessing. Taking, blessing … then we have the breaking and the giving. And we prepare for this in the words of The Lord’s Prayer. Then we have The Breaking of the Bread, what is also called the Fraction. Only when the invitation has been given, should the altar party receive Communion. It would be wrong for them to receive first and then invite others; this is work of the whole Church, and there are not two categories or classes of baptised and communicant members. The rubric states specifically: the presiding minister and people receive communion, and states this after the invitation. At the reception, our ‘Amen’ is our Amen to Christ present to us and among us in so many ways this morning … in Word, in Sacrament, and in us collectively as the Body of Christ. What happens to the sacred elements and the sacred vessels afterwards? 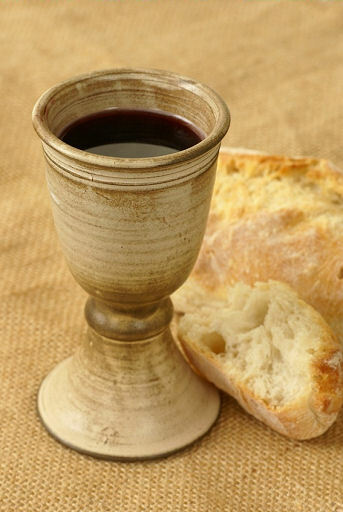 Any of the consecrated bread and wine remaining after the administration of the communion is to be reverently consumed. After the communion the vessels shall be carefully and thoroughly cleansed with water. When we have been gathered, we have had our Bible study, we have had our prayer meeting, and we have our meal together, we are ready for Going out as God’s People. We are ready for a Blessing to send us out into the world in mission. And then that’s it, Let’s go! Material from The Book of Common Prayer of the Church of Ireland (2004) © RCB 2004. Andrew Davison, Why Sacraments (London: SPCK, 2013). Andrew Davison, Alison Milbank, For the Parish, A Critique of Fresh Expression (London: SCM, 2010). Cyril E Pocknee, The Parson’s Handbook, the work of Percy Dearmer (London: Oxford University Press, 1965). Simon Reynolds, able Manners, Liturgical Leadership for the Mission of the Church (London: SCM, 2014). (Revd Canon Professor) Patrick Comerford is Lecturer in Anglicanism, Liturgy, and Church History, the Church of Ireland Theological Institute and chaplain of the Dearmer Society Ireland. These notes were prepared for a discussion at the first meeting in the new academic year 2016-2017 of the Dearmer Society in the institute chapel on 4 October 2016.